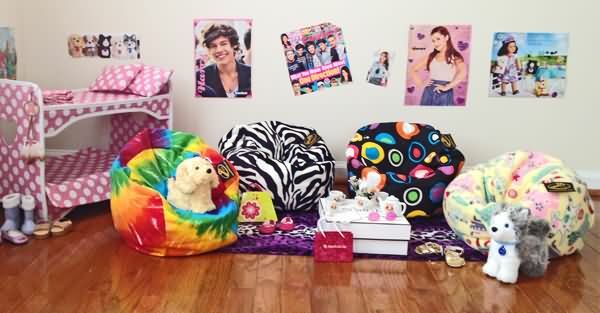 ENTER TO WIN A LIL ME BEAN BAG! 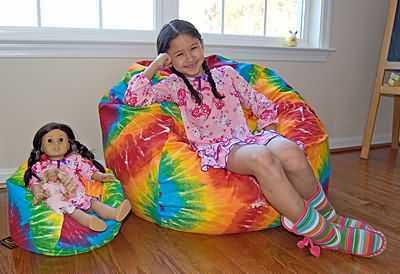 Introducing our brand new line of "LiL Me" bean bag chairs for American Girl-sized dolls and Teddy bears! Ahh... now you can get awesome bean bags for your little girl and matching miniature ones for her "babies"! These are the same top-notch, Made-in-USA quality as our regular bean bags...just in pint-sized form. Ahh! 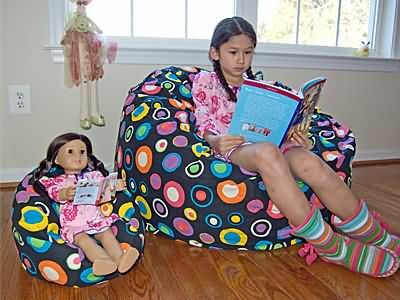 Products has been manufacturing and offering bean bags for kids and adults worldwide since 1998. But it wasn't until recently that the daughter of our CEO mentioned that she wanted a matching one for her doll. Light bulb! Why didn't any of us professionals think of that?! It took some time and lots of design work with the input of many kids, but we are now ready to release our new "LiL Me" bean bag chairs by Ahh! Products! Almost every style offered in our regular-human-sizes can also be purchased in our "LiL Me" doll-size. At 14 inches wide and 7 inches tall, it's the perfect size for 18 inch dolls, such as American Girls, to sit back and relax in. But don't forget Mr. Teddy bear and Mrs. Bunny rabbit, because these mini chairs fit stuffed animals, too! "LiL Me" bean bags come equipped with a child-resistant zipper, which can be locked and unlocked just like our exclusive liners. Curious kids, however, will not be able to easily unzip them. No one wants filling flying everywhere! "Lil Me" does not include an inner liner like our regular Ahh! bean bags do. It is unlikely that you would need to wash your "Lil Me" cover. However, if you decide to, simply unlock and unzip the cover to empty the filling. Make sure to store the filling safely away from children while you wash the cover. Also be sure to remove any loose filling stuck to the cover before putting into your washing machine. Or, simply hand-wash. Replace the filling when clean, remembering to reclose the zipper completely so that it is locked. PURCHASE a "LiL Me" BEAN BAG CHAIR NOW! Simply shop our regular bean bags and select 14" wide LiL Me for the "Size and Filling Type" option. You have a choice between "unfilled" and "filled". Unfilled is just the cover, ready for you to fill with your own filler. Filled includes our regular reground filler and is ready to use right out of the box. Note that the "LiL Me" warranty is one year (regular size warranty is 10 years). Below you'll find adorable pictures of our "LiL Me" and regular-sizes providing comfort and fun to girls and dolls alike. Come on, can't you imagine the squeals of delight when your child sees that she can get a super cool bean bag for herself AND a matching one for her babies? Tea party anyone? And, if you love our LiL Me logo, check out our LiL Me totes! Any questions? Just ask! We can also custom-make "Lil Me" sizes with your fabric, too! Zebra Fur & Girly Dogs Fleece - too cute!